View from the observation turret. A unique armoured caponnière was erected to cover the deep ditch of the fort. To close the gaps between the forts, several fortified batteries were built in between. Seperate toilets for (non)commissioned officiers and the sick. Observation turret on the backside of the fort. Double casemate for covering the back of the fort. Early 20th centry art work to make the inside of forts more livable. Casemate for a retractable gun turret. Observation turrets on top of the fort. The fort is now in use as a spa. One of several examples of modern reuse. Krupp double barreled rotatable gun turret. 2014 marks the 100th anniversary of the beginning of World War One. Neutral Netherlands didn't see any fighting on its own soil. It did however see thousands of refugees and prisoners of war. It also prepared for a war itself. The Defence Line of Amsterdam (in Dutch named Stelling van Amsterdam) is a 135 km long ring of fortifications around Amsterdam consisting of 42 forts. 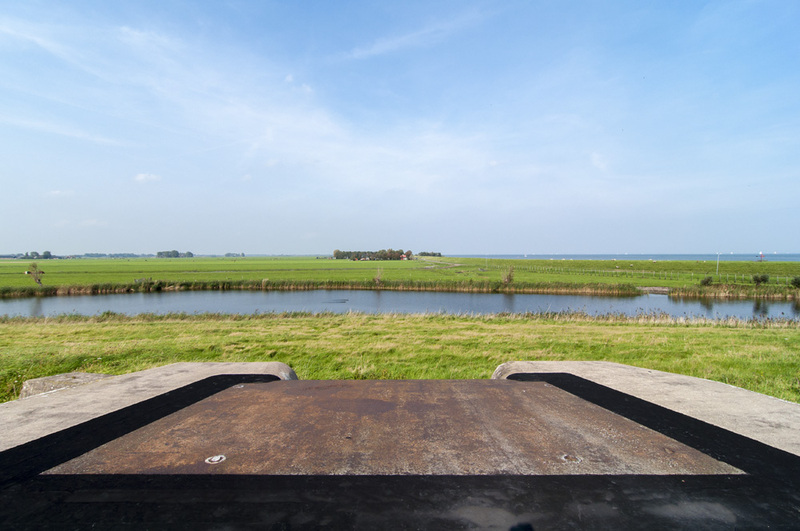 The defence was based on the flooding of lowlands and protection of high parts likes dikes and railways. At the beginning of World War One, the Netherlands remained neutral, and did not finish the defence line. New strategical insights during the war showed that aeroplanes, and mobile fronts made the forts obsolete. During the interbellum, only small concrete bunkers were added to vulnerable areas in between the forts. The entire line is now protected UNESCO World Heritage. The forts are environmental safe havens. They once were intruders in a quiet landscape. Nowadays they're part of it themselves.